Hi guys, it’s been a while since my last post, this time I want to share a tiny tip that saved me from a huge headache. At work we’re planning on using Trac to manage our project (mainly as an issue tracker) along with Mercurial. Mercurial is great, all distributed version control systems rock, but when we chose mercurial it just seemed like the right decision due to it’s excellent performance and relative ease to integrate with Apache. In any case, today I installed trac on our server computer, which unfortunately is a Windows machine. Unfortunate because setting things up on Windows is a bit more troublesome than on Linux or even Mac. Once Trac was up and running along with our Mercurial server, both under Apache thanks to mod_wsgi, I installed the TracMercurial plugin so that I could setup our Mercurial repository in Trac. But even after adding the repo, I could not even browse the repo. … returned a module not found error. Because I installed Selenic’s official windows binaries, the mercurial module is kept safe in the program files folder, where only the hg.exe binary can access it. To fix this, I just copied the mercurial folder that was in c:\program files\mercurial\lib\mercurial into Python’s site-packages folder (C:\python26\lib\site-packages when using python 2.6). And after restarting apache, I could see the “browse source” tab in Trac and all was good! And I needed a way to generate pretty graphs without too much headache! I am already using wxPython for the application’s UI (it saved me a lot of time, and I learned a lot in the process, even implemented my own clone of the Aero Wizard layout used in Windows Vista and 7), so I tried to look for a way to integrate some other super powered library into my app. I quickly remembered a couple of projects that used Graphviz to generate visualizations of Django model definitions: DjangoGraphviz, and django-graphviz. I even hacked one of them to generate visualizations where each app had it’s own color. But these were complicated projects, because they generated some funky XML (correct me if I’m wrong) files that where later fed to graphviz and you had to mess a little with config options. I wanted something simpler… lucky me, I stumbled into the wonderful project pydot. It was just what I needed, after a couple of experiments I could quickly generate “fantastic” visualizations with almost no extra effort. I’m using this on my Fedora 11 x86_64 box, so I just had to install pydot and easy_install handled the dependencies (it automatically downloaded and installed pyparsing), I am not sure what the requirements for Windows are… specially to get this running with py2exe, I’ll be blogging about that later. In any case, let me provide you with a quick “getting started” tutorial guide on how this works. Now… that looks pretty boring, right? Let’s try something some more… colorful and with a different kind of graph. Ok, on the last example we made an undirected graph, let’s create a directed one now, and let’s also add some colors and labels on the edges between nodes. 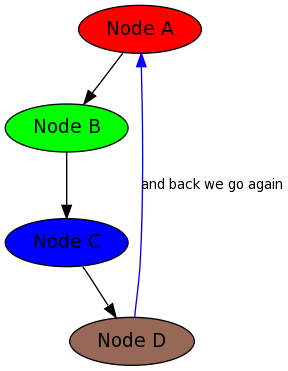 Say we have four nodes: A, B, C and D, were A points to B, B points to C, C points to D and D points back to A… let’s try that, ok? As you can see, the possibilities are endless, using the attributes you can set for each node, edge and other forms supported by the library, you can easily visualize your data that would otherwise be very hard to see. That can come in handy. Well, I hope you found this useful as I have, and that this mini pydot tutorial helps you with this great library. Hi, I have continued my experiments with the fantastic wxPython library. Today I had to create a simple grid, so I followed some tutorials and read some documentation on how to use wx.grid.Grid along with wx.grid.PyGridTableBase, in a very MVC-ish fashion. The thing is, that I correctly set up both (you can look up tutorials online on how to use them, or the fantastic wxPython in Action book (which was published back in 2006, making it a little bit old, but very a very useful and educational resource nonetheless). But when invoking the AppendRows or DeleteRows on the grid, I saw no change in the Grid’s presentation (although I double checked that the table’s AppendRows and DeleteRows where called accordingly). So, all I had to do was to send the corresponding message on my table’s AppendRows and DeleteRows methods and all worked just fine. Hope you find that useful too. Let me begin with this: wxPython is fantastic! I could write a moderately simple app in ~17 hours which automates a task that is normally done manually loading data into a web form. The app consists on custom wizard classes, access to web resources (requesting and parsing) and session management with cookies. I’m impressed that I could finish the application, with no previous knowledge on any of the aforementioned subjects, in such a short time span. After a quick read on several places, I found a simple solution for this problem, ignoring the dll file when building the executables. Both the “Microsoft.VC90.CRT” and “Microsoft.Windows.Common-Controls” assemblies are important. The first one is mandatory for Python >= 2.6 is built with Visual Studio 2008, and the second one is the one that links our app to the dlls that provide the nice XP Theme widgets. Today one of my teammates and I were working on a complex SQL query which was beyond Django’s ORM normal API, so we had to use the extra method to build the query. After running with a couple of issues with PostgreSQL’s GROUP BY we decided to opt quickly for subquieries, and in no time we had our query done. The problem was though, that we had to do this operation on several models that where similar to each other, the only thing that changed was the WHERE clause depending on the models involved. So now I know that if I want to build a custom SQL in Django and I really want to make it generic as possible, I can use this RelatedObject class along with other interesting model attributes like: Model._meta.db_table (getting the name that the model has on your database) and such to make my code 100% portable 😀 (or at least try to). "WHERE date_part('year', reg_date) = %d "
Now, if there is an easier way to do this, please tell me, I’m eager to learn! Configuring Apache + mod_wsgi + django… on Virtual Box serving files from Windows 7! If you enjoy reading about weird software combinations let me tell you about my system configuration. I am currently using Windows 7 RC as my primary development OS (I quickly replaced my XP SP3) and I am finding it quite good to use (waiting for that new Fedora with the lovely Kde 4.2 to come out). In any case. I wanted to test how to set up Apache on a linux machine, but I didn’t want to go through the hassle of partitioning my HDD (not yet) so I decided to try Sun’s Virtual Box virtualization solution. I did have to download and install the PIL library by hand because I didn’t find the appropiate package for fedora and I already knew I could downlaod the tar.gz file from their site and use the infamous setup.py install command to install it. The thing is, I want to keep my development files in sync with the files that were going to be served by Apache, that is, find a way to mount some sort of virtual drive connecting the virtualzied Fedora with the Windows 7 host. Thanks to Virtual Box’s shared folders options this was a breeze! So I set up a shared folder on vbox’s shared folders menu, I pointed that to the trunk dir of our project and named it “mgtrunk”. Obviously I created the “mg” folder at the “mnt” directory previosly :). A quick reboot and everything was good to go. I edited it adding lines like the ones in mod_wsgi’s integration with django wiki page relating to the Apache config. And also created a django.wsgi file in my django project under the apache/ dir, just like the aformentioned page mentions. With a lot of expectations I started the httpd service, and rushed to http://localhost/ on my browser… BOOM… Cannot load the page, followed by a pesky SELinux ballon hovering on the screen. What to do? Disable SELinux through it’s administrative interface, I have no time tonight to mess with yer configs (I did try… chcon’ing some files… but errors just kept on appearing from nowhere! So I just disabled SELinux). A final service httpd restart…. and… yay! The site’s working correctly, at last! Quite an adventure… Now on I can go to try to develop a super scalable WSGI application to interface with my Django site like Eric Florenzano’s Writing Blazing Fast, Infinitely Scalable, Pure-WSGI Utilities blog article.